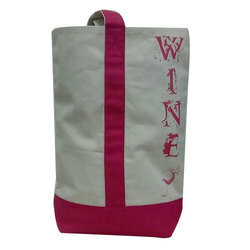 We are one of the leading manufacturers and exporters of Jute promotional bags. 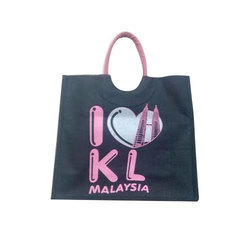 We also make tailor-made Jute promotional bags based on the customer's specifications. 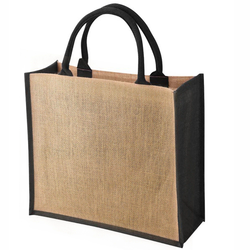 A light-weight, Natural Jute Promotional Bags with strong cane handles is convenient to use and carry. 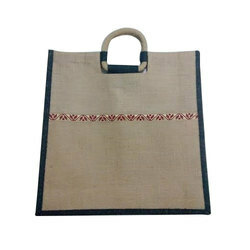 This jute promotional bag is spacious for all your daily shopping needs. This jute promotional bag provides ample of space for promotional messages, pictures etc. These natural promotional bags are offered with a chain and are utilized to for storing daily chores things and zip it up. 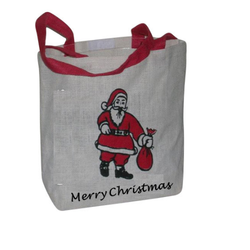 We are one of the leading manufacturer of Christmas Promotional Jute Bag. Our wide range of Merry Christmas Promotional Bags is tremendously applauded in the market for their features such as easy to carry and most recent designed in such a way to match with both fashionable. These bags are available in speckled designs, patterns, sizes and colors to meet the assorted essential requirements of the clients. We export these bags, which are made using finest quality materials based on latest innovative technology. Our bags clients can avail from us at most reasonable prices. Presenting Laminated Jute Promotional Bags having round cane handles with three loops in front give the bag an elegant look. This jute promotional handbag not only has a wide red border but at the same time it has space for promotional messages etc. This Soft Rope Filled Jute Promotional Bags is made using quality jute and have soft rope-filled handles which makes the bag easy to carry. This Jute promotional bag has plain front and back that gives ample of space for promotional messages etc. A white and attractive Jute Promotional Bags, which is not only Eco-friendly and recyclable but also strong to carry loads of things. This type of Jute promotional bag is perfect for trade shows, departmental store etc. These jute promotional bags have space on both sides for printing slogans, pictures etc. 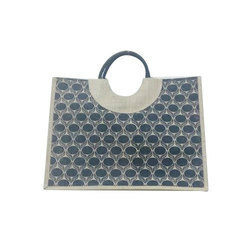 Avail a Jute Promotional Bags in two-tone color combination of black and white. This jute promotional bag is attractive, unique and perfect for promotional purposes. This jute promotional bag is made from high quality jute and comes with dual color soft handles that is comfortable to hold and carry.